So many moms ask me how I manage to “do it all.” I am a homeschooling mom to seven with two home businesses, and there is always something to do. Well, I have a confession to make. I do not have it all together. Truly, I don’t. I want to be more organized, more focused, more intentional, more this, more that. But I fail daily. I forget that I am not supposed to do it all, that I am supposed to get by on God’s grace alone. I let myself drown under the weight of everything that I have loaded onto my plate. I forget to make myself a priority. When I get overwhelmed, it can consume me. I may dread getting up in the morning, even though I love my morning quiet time, knowing how full my plate is before I even get out of bed. I can snap at my children, just for being the blessings they are. I might now be the gracious, supportive wife that I should be to my husband. I can freeze up, and not actually accomplish anything when my to do list is never ending. I know I can’t be the only one to feel this way. You all have probably noticed that my posts lately have focused on simplicity, on doing less and living more. Well, after going through a period of complete overwhelm (and affecting my entire family), I decided to make some changes and took some steps to get myself from overwhelmed to organized. I simplified, I prioritized and I focused. Now I want to help you. So many of wives and moms have recently shared with me how they’ve also been struggling with being stuck in a place of overwhelm, lack of focus and productivity. It must be the time of year, with school in session and schedules changing. One of the key factors in being able to get yourself from overwhelmed to organized is connecting with other people who have been where you are, can offer heartfelt insight into your situation and also give you the gentle nudge to actually start! Where would we be without community? So, I learned all I could and implemented a few simple steps for myself and decided to create a new FREE 5-day challenge called “Overwhelmed to Organized” for all my sweet mom friends! This simple challenge won’t add another thing to your already busy schedule. That would defeat the purpose of this course. This challenge is meant to equip you with simple tasks you can implement and a little accountability, encouragement and support along the way as you gain some organization in your life! Every day for 5 days you will receive an email delivered straight to your inbox containing a short lesson and a step to actually implement what you’re learning. You’ll also have access to our member’s only Facebook group to connect and engage with the other wives and moms going through the challenge along with you! 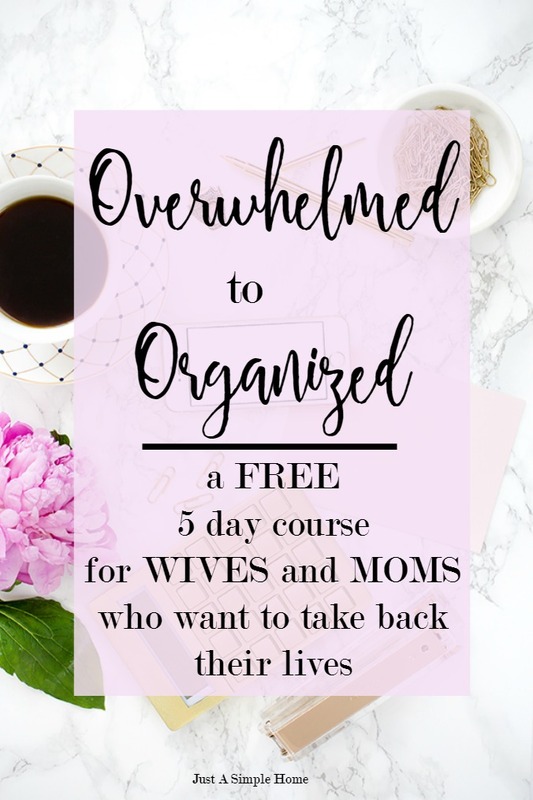 So, if you’ve been feeling a little overwhelmed lately and are ready to gain a little focus and a little organization in your life, join me and sign up for the Overwhelmed to Organized Challenge today! You can sign up right here and get started right away. And, don’t forget to invite all your wife/mom friends! Can’t wait to connect with you in the group! We all get overwhelmed and feel like failures some days. Getting organized would certainly help. I always need help in the organization realm! Sounds like a great resource. That five day challenge looks like something I could use for sure! I’ve been all about organization these days, and trying to find productivity hacks, so I will for sure sign up! Ooh can’t wait for the challenge! I’m on an organizing frenzy before we welcome our first baby, so that is a top priority around my house! I know that feeling well, Jackie! When are you due? I can so relate to your feelings. I am sometimes organized, but then certain things in my life are really disorganized. I need to get it together! This is super exciting! I’m so jealous of those people that have all their stuff together and have all these to do lists that they actually use properly and they schedule every little thing and time block and all that crazy organized stuff! I think this is something so many moms feel! I’m sure your course is going to help so many women get out of that downward spiral of feeling frazzled and overwhelmed and into a more peaceful home and state of mind. I signed up!! This title is so me :). Even if I’m not a mom I still feel crazy overwhelmed, and the dream is to get organized! This sounds amazing! I can’t wait!! This is an awesome idea for an e-course! I’m sure there are so many people (moms or not) who can learn something from this! I’ll be sure to stop back and read! This sounds great, thanks for sharing! I just moved into a house and am trying to figure out the balance of getting everything done while still finding time for myself and to relax! This is amazing. Some days I feel like I have things together and others I feel so overwhelmed, so this is such an awesome post to share. Very important to get organized. I’ve been a list maker all my life. My dad taught me. He’s has lists of the lists he’s made. I have reminders on my phone, a calender on my ipad, a printed calendar on my desk and a list of things to do from my goals . If it ain’t on my to do list, it don’t get to done. Yep, trying hard to get organized, especially since the kids went back to school…SO MUCH PAPERWORK! I love being organized and I find the days I start earlier then when my son wakes are some of the best. This is how I feel being a full time student, full time working women, and having my own place. Sometimes it is just too much to manage. Thank you for sharing, I feel less alone. What a lovely idea, too often we forget about ourselves!! So many women need this! Every day I feel like my to-do list spills over and just compiles, and I’m a pretty organized person! Great idea for an e-course. Being organized helps me with managing stress. The crazier things get the crazier I feel. I can always use help. Signed up! I would love to sign up. Will this be offered again? I have many deadlines and commitments right now. Could you possibly email me email below or my VA (maqhvtria@gmail) with details? It may work out for me to try it now depending on the time commitment. Of course Amanda! I can tell you that this is an email course, so you will get one email a day with a lesson and accompanying step to take. We officially start Sunday, but you can start any day you want! The days will be clearly labeled, so you can complete it at your own pace. You will also have access to our private group for the added support. I signed both myself and my VA, Maqhi (maqhvtria@gmail.com) We are excited to be getting some help! Overwhelmed happens at any age and any stage of life….whether you have little ones or are an emptynester. When the kids grow up the grandbabies come back and somehow all the free time you thought you were going to have doesn’t happen because you would rather be loving on your grandbabies. Great idea for an e-course! Thank you Sheila, you make some great points! I guess I really better get organized now…can you imagine how many grandbabies I could have?! A great challenge — sharing this with my followers on social media! We could all use a bit more organization in our lives! Oh I SO need to check this out!!! I’m naturally an organized person but lately I’m seriously struggling! Love this – so glad I found your blog! This sounds like a great resource, Terryn. Thanks for sharing with Thankful Thursdays. I’m feeling overwhelmed a lot lately and I spent my staycation setting up a new desk. My goal is to set specific times to do work in the office only. It’s a learning process for sure. This sounds great! I’m movin next week so it’s perfect timing! Did I miss something? We (myself and my VA) did not receive the course yet. Hi Amanda! Thanks for reaching out! I just checked and I see that you were sent Day 1 yesterday at 2:30 pm EST. Perhaps it went to your spam folder? I am happy to resend it, just know you will have a duplicate. Day 2 is scheduled to go out shortly as well 🙂 I see your VA has received 2 emails, but neither has been opened. Again, I can resend her Day 1 as well. Let me know if you have any more issues! maqhvtria@gmail.com. I will check with Amanda later today. Maqhi here. The first one just arrived. Thanks. What an awesome thing to offer! I can totally relate to being overwhelmed and needing to be way more organized! I am generally organized by nature, but when I miss a day- forget about it. I definitely get overwhelmed when I fall behind. I have all these ideas to organize and never time to implement them. I think I need a “free day” to get things done every week. Girl! I have a baby coming in 7 or less weeks and I am moving into my new house in 6 weeks. I have been feeling all sorts of overwhelmed lately. I need to check this out! Wow Logan! You have a busy few weeks coming up! Congratulations 🙂 At least you’ll have nesting kicking in…Is this your first baby? I need-need-need to be organized to feel at peace in my little world. However, when one thing goes wonky, I am all out of sorts. I want to better manage my organization – and this can be so helpful to me. Thanks! I like being organized and when I’m not, I know I need to scale back and let some things go. It’s nature’s way of telling me to back off! Since becoming a blogger adn mom I’ve become disorganized. I could use some tips on gaining some organizing skills. I have been working on becoming organized also. I recently bought one LARGE old fashioned spiral calendar that I now carry with me everywhere. Apps are great but they just couldn’t do for me what a pencil can do. It is already helping a lot – when I remember to look at it! I hear you Rachel! I am a pen and paper girl myself. Give me a list and I am a happy planner! I feel so much better when I am organized and I know what coming next. This is great! We all tend to over complicate our lives and that’s what usually leads to being overwhelmed with the things that we have to accomplish within the day. I think it’s good to go back to the basics and just keep it simple. This course will definitely help a lot of women. I think that the best thing about finally getting organized is the feeling of relief you feel afterwards! It is such a great feeling. My biggest problem is I AM organised. It’s everyone else around me who isn’t . When I organise them, or get them to pitch in, it all goes to pot. The only way i remain oragised is to do it myself. I think I could use this five day challenge. If you think about it, life is so simple, but we tend to complicate it with so many things. I need to check this out. I’ve been starting to feel overwhelmed with the end of my pregnancy approaching. I love that you organized your life in such simple ways to help the stress. Love this! I need this so bad. I find myself in the worst moods when my home is cluttered and I’m falling behind on chores. But I feel much more at peace and at ease when it’s organized. I’m signed up and excited! I’m so glad Chelsea! I’m excited for you! What a great resource. Thank you for offering it. I am totally overwhelmed and need to get organized. Just signed up! I just signed up for this. Looks like just what I need. Your sign up page is gorgeous and I felt more relaxed just going to it. Looking forward to starting! Vicky, thank you so much! That really means a lot to me. xo So glad you are joining! Hope to see you in the group. Good idea for a course. I think everyone feels pretty overwhelmed in life but if you can learn to not sweat the small stuff, sometimes you won’t feel as pressured. This is a great idea for a course! I’m fortunate that this is one area of my life that I seem to have under control. Ahhhh I thrive on organization!!! Nothing makes me happier than my planner and jotting things down! Organized is one thing I am not! I used to be much more so and then I had three kids and things got crazy! I definitely need this course! Three kids is where it happens, isn’t it?! Lol. Glad you are joining us! This looks like a great course that would be helpful to lots of people, especially moms!! Sometimes it is hard to stay organized, mom or not! Aww, thank you so much Stephanie xo It is a space that I love. I love this idea! What a great course, it’s definitely needed by so many people. I know that it’s hard to stay organized as a mom. We all need a little motivation to get our act together sometimes. This sounds like a great way to do it! i need someone to come and help me organize everything in my life and house. thanks for the tips, they are great. Congratulations! It is so exciting being a newlywed. Just wait until you have your first baby 🙂 You may find a new definition of busy xoxo Hope you join us! What a gift to women everywhere! I just signed up and can’t wait to get started. I’m a new follower now and will be sharing this all over social media. Thanks for the encouragement! I just love this! It’s so practical and needed. Organization can be so hard. Thank you for this! I literally could have written the first paragraph of this post myself, it’s exactly how I feel alll the time! I’ve signed up! This is such a thoughtfully written post. I’m not a a mom, but I swear sometimes I live the life to two or three people in a week! My Mom sometimes gets on me about it, but I’m getting much better. I dedicate a lot of my time to helping others, which requires that I be better organized. This year I’ve started the 2017 WHO Challenge. A challenge where I organize my entire home – one room at a time. I’d love it if you could drop in Terryn. I think you’d like it. This is a great idea Terryn! It’s so easy to get lost in everything we haven’t accomplished or feel overwhelmed with long lists. We can never forget to give ourselves grace. This is just what I need! I fancy myself organized by we can always be more organized!